Celebrate the bounty of Halloween with Mr. Sloto and scare up serious wins with a couple of spooky-awesome bonuses and up to 350 Free Spins that are yours when you deposit as little as $30 before October 30th! Fill your trick or treat bag with wins when you collect a 100% Match + 50 Free Spins you can play in our witchy Bubble Bubble slot. Continue your Halloween wins with a 150% Bonus and 100 Eternal Love Spins and your account will be topped with even more big bucks with 200 Extra Count Spectacular Spins! Decorate your Sloto’Cash account with wins this Halloween season when you deposit a minimum of $30 today! 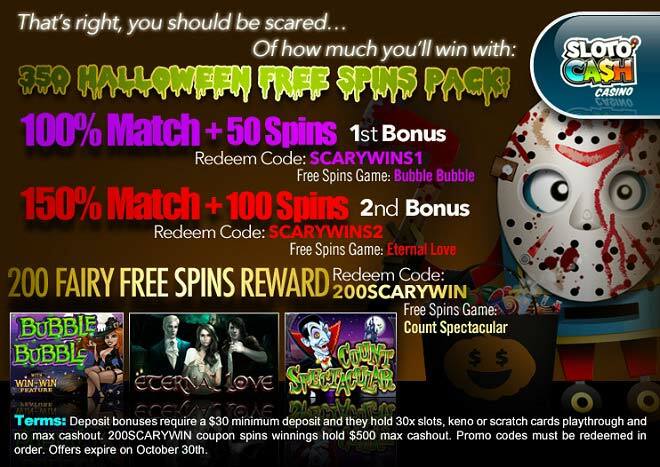 200 Scary Free Spins Reward!